The book is wonderful. Thank you very much. Well your masterpiece arrived in the form of a neat six-pack – chock-a-block full of wonderful pics and really well written efforts, including yours, from a wide variety of contributors, including you. I’m so glad you decided to include me in the end and I’m proud as punch to be a modest part of this final book of the series. Following your suggestion in our recent E-mails, I turned right to your conclusion and read it carefully. I appreciate the the risk you have taken in expressing so candidly your conclusion for this book and, unfortunately, for African habitat and fauna in general. However, I will venture to say that none of the many true experts and enthusiasts who have responded to your invitations to contribute would disagree in any way, for you speak the truth – plain and simple. My favorite article thus far is Christophe Morio’s, “Hints on Hunting Western Bongo”. I have never met him, as indeed is the case for me with so many distinguished PH’s and clients of recent times. But Christophe writes modestly and pearl after pearl of wisdom and depth of experience just roll off his pen. His paragraphs on the top half of Page 117 exemplify this. How often are the truly best hunters the ones who understate their proclamations and their accomplishments. Peter, these books in your spiral horn series, while undeniably valuable to any prospective hunter, are even more so to the well experienced hands – particularly in this last effort. This is perhaps best illustrated by the opening paragraphs in your Introduction (which, as I said, I read after the Conclusion.) Why is this so? I would say it’s because the people and material you present so well are first and foremost authentic and accurate. So it can be said that authenticity prevails in this book. Furthermore, who but you could research to such an extent the related historical, biological, anthropological, political aspects involved then write and edit all this whilst illustrating the project with such diverse, interesting and hard to assemble photographs, for it is as much a visual treat as it is a written effort. I am particularly fond of your mixing every manner of illustration ancillary to the various pages so they enrich and amplify as we wend our way through. The reader can literally turn to any page randomly and find a collage of related delicacies which go along with the subject at hand to form a more complete and artistic tapestry. I am reminded of Peter Beard’s books in this way, and I well remember the frustration of his publishers who rolled their eyes as he labored intensively at the printer’s shop to fashion the wings of some insect he insisted on pasting to a certain page before duplication. Of course the proof is in the pudding and I can’t imagine any of his books without these. You may not have labored to produce an actual “ndudu” for every page, but you consistently present additional visual treats with artistic sensitivity so they enrich your creation. Well done, Peter! I could go on and on, but I think I should pause now until I have read a bit more. I just received copies of your book. What a superb, beautiful effort. I know you are proud of the outcome. And I am proud to grace a few pages with past and present legends of African history and hunting. A beautiful and well published volume –well done. I recently received the final book in the spiral horn series and in my humble opinion, it is your best yet. The material is excellent and the photos are superb. I especially appreciate your kind inclusion of a tribute to Tony Tomkinson. He did more than anyone to open my eyes, excite my curiosity, and shine a light along the hunters path. His knowledge of the spiral horns was deep and he shared it easily. Acknowledging his contribution was appropriate and will be welcome by all that knew him. I just wanted to congratulate you on the new Bongo and Nyala book. It looks great! Thank you for letting me be a part of it. Hunting the Spiral Horns – Bongo & Nyala – The Elite African Trophies, edited by Peter Flack, is the fifth and final book in a five book series covering all 30 spiral horn species and subspecies (recognized by both Rowland Ward and SCI) and is designed to be the definitive book on hunting the two bongo subspecies and two nyala species. It is effectively three books in one and is, therefore, a big book - 432 pages long, with 679 photos of which 642 are in full colour and 37 in black and white. The 30 hunters and authors who contributed material specially written for the book read like the Who’s Who of bongo and nyala hunters and include luminaries such as Robin Hurt, Garry Kelly, Rudy Lubin, Mike Prettejohn, Jason Roussos, Tony Seth-Smith and Coenraad Vermaak to name but a few. The book also includes the exploits of famous hunters of yesteryear such as Christy, Drummond, Du Chaillu, Ionides, Maydon, Mellon, Powell-Cotton and others as well as chapters on rifles and ammunition, clothing and equipment, field preparation and “How To” chapters by passionate and very experienced bongo and nyala hunters. The object of the exercise has been to provide the reader with the complete book on hunting the two subspecies of bongo and the two species of nyala, including all the information it is possible to learn from reading a book on the subject. Each of the hunting stories in the book has been chosen because it is well-written, entertaining and has one or more lessons in it. Some of the lessons are subliminal, others more obvious and direct. This is the fifth and final book in the five-book series covering all thirty spiral-horn species and subspecies that are recognized by Rowland Ward and SCI. 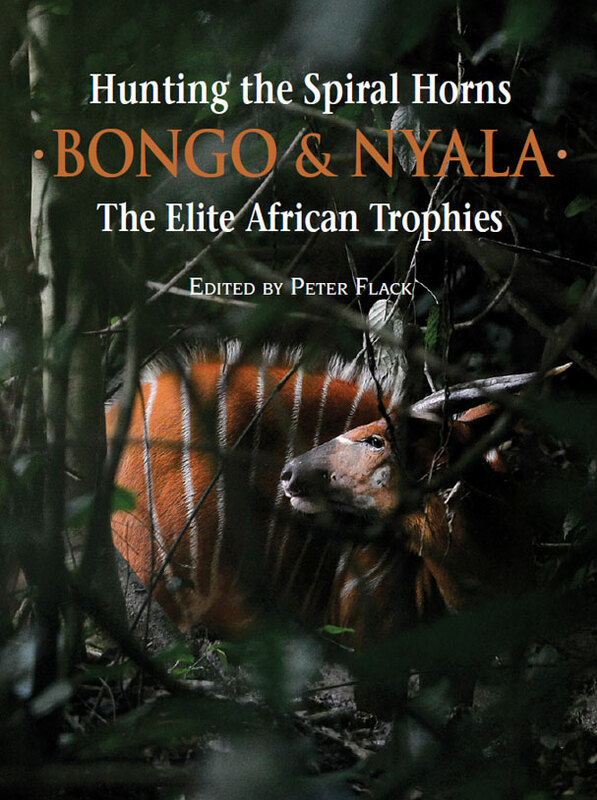 Describing the two bongo subspecies and the common and mountain nyala, and all what comes with their conservation and hunting, Peter Flack’s well-known ambition to produce a perfect product undoubtedly won again. This massive book is simply the best and most comprehensive book for these elusive dreams of many an African safari addict. In his foreword, our mutual friend Shane Mahoney brilliantly describes Peter Flack as "representing that remarkable amalgam that has emerged throughout the history of wildlife conservation; namely, a man who in his heart and intellect is a hunter but who is to such an extent inspired by the wild creatures he pursues that he comes to view their natural persistence as the greatest objective of his life." In parts one to three, with ten chapters altogether, Flack covers not only the historic aspects of the discovery of the three species; he also gives tips on where to find and how to best hunt them. The scientific chapters on nyala and mountain nyala have been written by two outstanding experts. Dr Jeremy Anderson (South Africa) wrote his doctoral thesis on nyala after studying them in the field for many years and Dr Paul Evangelista, considered by his peers as the leading expert on mountain nyala. Peter Flack took it upon himself to painstakingly research the western and eastern bongo – from its first documented appearance in form of some horns and bones pieces in the halls of the British Museum, to the latest population estimates in Eastern and Western Africa; from the stories of early hunter-explorers to the tales (and brilliant photos) of modern hunter-conservationists. Biology, distribution and life history of the two bongo subspecies are intermingled with entertaining hunting stories past and present. The chapters are complemented with hunting adventures as told by Mike Prettejohn, Robin Hurt, Pemble Davis, Ross Murphy, Eric Mararv, Adam Parkison, Christophe Beau and of course Peter Flack’s own quest for a monstrous and ancient western bongo. Professional hunters Christophe Morio and Rudy Lubin chip in with tips on hunting bongo in West Africa. Jeremy Anderson describes the graceful nyala of southern Africa in his extensive chapter “From Rare to Abundant: Natural History of the Nyala”, as behooves a man who spent his life studying these animals. Garry Kelly, South African Outfitter extraordinaire, and his brother John talk about hunting outstanding bulls, with young Danie Geel giving a riveting story of bowhunting one. Hans Schabel tells his story of hunting this shy antelope in Mozambique, which the well-known Mark Haldane amplifies with tips towards hunting them in this hunter’s paradise. The late Anthony J. (Tony) Tomkinson lets us partake in the “Nyala Conservation And Hunting Success Story”. Peter Flack’s old hunting companion Peter Kennedy rounds off the chapter with an exhaustive and entertaining list of tips on how, where and when to hunt this essential Southern African antelope, and what equipment to use. The third part of the book is dedicated to the shyest, most elusive (and most expensive) monarch of them all – the mountain nyala of Ethiopia. It is aptly introduced with a most complete article by the foremost expert on the species, Paul Evangelista. Peter Flack answers all remaining questions on hunting methods, equipment, hunting areas, and everything else an aspiring mountain nyala hunter wanted to know. One of the stories I liked most in this book is the late Sherwin Scott’s epic tale "There comes a time ...". I had read it years ago, just months before Sherwin passed to the Great Hunting Grounds Beyond, and it made a deep impression. Sherwin’s adventure together with PH Jason Roussos is what hunting is all about! And there is also Gwyn Brown’s mountain nyala story, in Peter Flack’s words a petite, very feminine yet very experienced, passionate and determined huntress, as well as the story of Peter Treboldi’s hunt! Jason Roussos, hunter, outfitter and guide in Ethiopia who guided over 100 hunters to mountain nyala gives all final answers in his section “Mountain Nyala – Understanding Them, Hunting Them and Guiding for Them” – and, let me mention this too – his everlasting fight to protect their habitat and conserve this mighty mountain ungulate. Flack rounds off his last book on the spiral horns with sections on clothing and equipment, a rainforest checklist, rifles and ammunition – all typically Flack, well-researched, tested and meticulous to the smallest detail. His friend and master taxidermist Rodney Kretzschmar takes care of the part on trophy care and preparation. In his final musings over the state of wildlife, conservation and hunting in Africa I recognize the Peter Flack I have known for years. His words may sound cynical at times, but I suggest that this book, and indeed the entire series on the spiral horns, will inspire a new generation of hunters to come to Africa and put their energy and talent into saving what’s left of the great African wilderness and the great game of the continent. Buy the book, read it, enjoy it ... and then do it! Africa needs you! This is the fifth and final book on hunting the spiral-horned antelope species. For five years Peter Flack produced a book a year on these iconic animals. The previous ones were on kudu, eland, bushbuck and sitatunga. 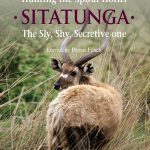 The sitatunga book was outstanding, probably the best one of the series, or so I thought until I had a good look at the bongo and nyala book - it is simply outstanding. Peter writes that the forest-loving bongo changed his life. Already in his 30s, Peter had no idea what a bongo was, but when he found out, this beautiful antelope lit a fire inside of his soul. He would not rest until he had hunted one. Hunting in a rainforest where everything is a monotonous green and sight almost always limited to a few metres is not fun. Peter and his hunting guides once followed a bull for ten days before he managed to shoot it. That was after they had slept on the animal's trail after day nine. He eventually shot the trophy of a lifetime in the Central African Republic - the new world record Western bongo. The longest horn measured 361/8" and topped the previous record by almost an inch. Finding a decent mountain nyala trophy is also very difficult due to this animal's very limited distribution in Africa. For these animals you have to go to Ethiopia. They are only known to occur in three mountain ranges that define the east side of the Great Rift Valley in that country. The ordinary or "common" nyala we know in South Africa is an abundant species thanks to modern game farming. They can now be found all over our country and shooting a good, "semi-tame" trophy is not difficult at all. However, to find a truly wild one with horns measuring 30" or longer is very hard. Although he has hunted nyala many times, Peter still has to bag that magical 30" bull. Covering the two subspecies of bongo (Eastern & Western) and the two nyala species, this final book on the spiral-horned species is a real blockbuster. It has 432 pages, 679 photos (642 in full colour) and weighs a "ton". Twenty four prominent hunters, all experts in their respective fields have written articles for this book. The book is divided into four parts. Part I (pages 3 to 131) covers the bongo. Part Il (pages 135 to 249) deals with the common nyala (Tragelaphus Angasi) while Part Ill discusses the mountain nyala in detail. Part IV (pages 357 to 403) covers hunting clothing and equipment, a rainforest checklist, rifles and ammunition for bongo and nyala, the current state of bongo conservation and field preparation and trophy care. Although bongos have been the least studied of all the spiral-horned antelope species, this book is a well of information on these forest-loving animals. Everything about the bongo is covered, from its taxonomy, distribution, habitat, reproduction, to its food and current numbers. A fact that I did not know is that bongo males and sitatunga females apparently have produced fertile hybrids in captivity. The general information on the bongo is followed by tips on how to hunt them and here experts such as Christophe Morio and Rudy Lubin share their knowledge. It was the early explorer George French Angas who brought the nyala to the attention of scientists. During his visits to Southern Africa he collected samples of this specie on the western shore of Lake St Lucia. Nyalas were quite scares in South Africa then (1848) due to uncontrolled hunting by local tribes, unsuitable habitat and the fact that where they occurred in our country, (Northern Zululand in KwaZulu-Natal) was right on the edge of the species' then distribution. Back then nyalas actually occurred mostly in Mozambique. Several prominent South African hunters, among them Coenraad Vermaak, Tony Tomkinson, Peter Kennedy and the young Danie Geel (a bow hunter) tell of their experiences and how to hunt nyala. The mountain nyala or gedemsa (fragelaphus buxtoni), as it is known to the local Oromo people in Ethiopia, was hunted for the first time by westerners in 1908 (Major Ivor Buxton and his associate MC Albright). They presented Richard Lydekker of the South Kensington Museum with samples and he described it in an article in 1910 as a "spotted kudu". 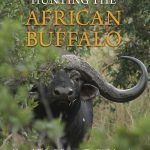 Peter's contribution to this part of the book is a very good piece titled: Everything you always wanted to know about mountain nyala hunting but were afraid to ask". If you ever want to visit Ethiopia, be prepared for the widespread corruption and bureaucracy. And when you hunt in Ethiopia there is probably no one better than the father and son team of Nassos and Jason Roussos of Ethiopian Rift Valley Safaris. The legendary Roussos team certainly knows their stuff when it comes to mountain nyalas. The part that covers hunting clothes and equipment as well as rifles and ammunition for bongo and nyala is very informative and provide sound, practical advice. This book is certainly worth reading and belongs on every hunter's bookshelf, even if you have no plans to hunt a bongo or nyala. We thoroughly enjoyed the bongo and nyala book and recommend it highly. It really is a book of the highest quality. The standard book retails for R950 and the limited edition for R1 950.